A new double-storied wing was added to the Columbus Museum of Art. The last phase renovation and expansion project at the Museum started in August 2014. The $37.6m expansion project was completed in October 2015. The new wing of the museum offers 50,000ft² of floor space. 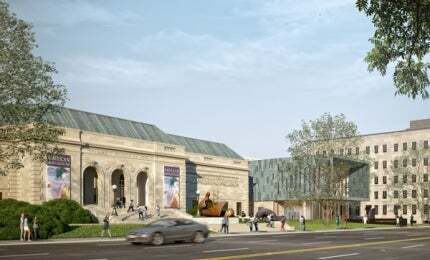 The Columbus Museum of Art located at 480 East Broad Street, Columbus, Ohio, US, underwent a $37.6m expansion and renovation project that comprised the third and final phase of the museum’s ‘Art Matters’ renovation and expansion masterplan, which has been implemented since 2009. The first phase of the museum redevelopment, which included the renovation of Beaton Hall, was completed in 2012. The second phase included the renovation and restoration of the Italian Renaissance Revival Building that was built in 1931. The latest expansion and renovation project broke ground in August 2014 and involved the construction of a new 50,000ft² wing, named as Margaret M Walter wing, and the renovation of the 38,000ft² Ross Wing, which was built in 1974 and houses the museum’s lobby and temporary exhibition space. The third phase of the project was completed in October 2015. The project also created a new entry experience and sculpture garden, while providing additional gallery spaces, expanded areas for events, a new store and a restaurant. The lead architect for the project is DesignGroup. The new wing added to the Columbus Museum of Art is a new, two-storey building structured as a long bar of gallery space on the east side of the site. The galleries of the new wing are connected with the existing buildings by three bridges at the second floor connected with the glass-enclosed and naturally lit multilevel concourse termed by the designers as the ‘Shard of Light’. The new wing’s north and south facades are transparent ‘cinematic facades’. "The first phase of the museum redevelopment, which included the renovation of Beaton Hall, was completed in 2012." An entry forecourt, the central organising element of the project, provides access to the new sculpture garden to the West and a tree-lined lawn along Washington Avenue to the East. An iconic sculpture is planned to be placed in the green space along the Washington Avenue. The renovation involved the relocation of the old sculpture garden and creation of a new sculpture garden, which will house the museum’s collections and events. It features four sections namely the Café Terrace, the Sycamore Grove, the Event Lawn and the Birch Walk. The new sculpture garden was named as the Patricia M Jurgensen Sculpture Garden, also known as Patty’s Garden, in September 2015. Apart from providing large and flexible exhibition space over the first floor gallery spaces, the second floor of the new wing houses an event court, which is designed to overlook the sculpture garden to the north. The sculpture garden is accessible by a staircase from an outdoor terrace for events. The glass, multi-level concourse and the three bridges connecting the new wing with the existing building are supported by steel structures. Both the ends of the new gallery are fitted with glass panels held by a grid structure. The new building has a metal roof decking and the terrace leading out of the special event space is made of an assembled steel structure. The renovation retains the cast-in place frame and the art transport elevator from the existing Ross Wing. The building structure combines cast-in place, post-tensioned concrete, concrete masonry walls and structural steel. The new and expanded gallery areas are used to house both the museum’s present collections and new travelling exhibitions. The new retail store and café with connections to the outdoor spaces are located at the ground floor of the new wing. Large foldable glass wall panels open up the cafe to a terrace, which overlooks the new sculpture garden. A master plan for the expansion and overhaul of the Norton Museum of Art in Florida was unveiled in December 2013. An existing auditorium in the old wing of the museum building was also reconfigured as a 288-seat auditorium. An air-conditioned and fully enclosed loading dock was constructed in the museum’s ‘back-of-house’ for secure handling of artworks. The building also features other facilities such as art storage spaces and event support spaces. The construction of the new building involved Zahner pre-patinated ‘Star Blue’ copper, Indiana limestone, and Kawneer 1600 Ultra-Thermal curtain-wall glazing. The upper gallery is a clad in copper using a Keith Panel reveal system, following a pattern designed by the architects. The first floor gallery is clad in limestone and glass. The exterior pavement within the forecourt and garden is made of Cold Springs ‘Charcoal Gray’ granite with a rub and sand finish. Perforated panels are used in some placed as a screen to discreet light source to give the building a different look at evening. The event space features Vogl ‘DeckenSysteme’ perforated acoustic drywall panels. The project aims to achieve Leadership in Energy and Environmental Design (LEED) Silver certification. The new building requires 16% less energy, compared with other typical baseline museum buildings. The construction debris was land-filled by more than 75%. Corna Kokosing has been engaged as the main construction contractor for all phases of the renovation project. MKSK Studious provided Master Planning, Urban Park Design and Construction Documentation services.